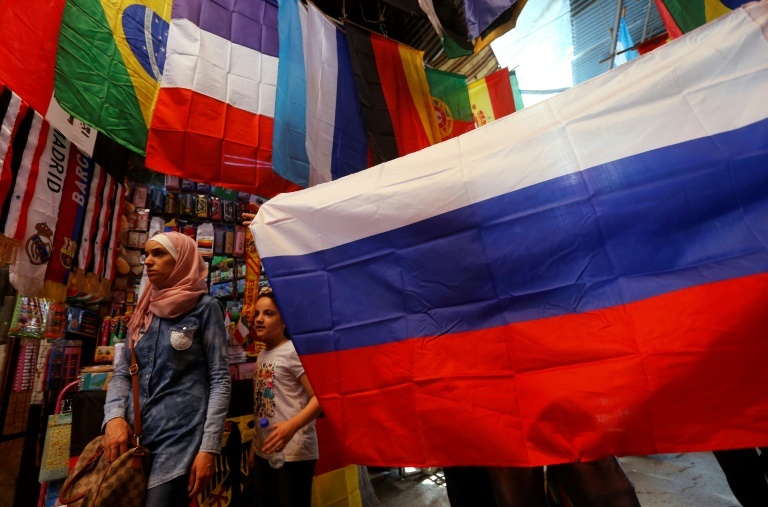 With days to go before the World Cup, bustling markets in Syria's capital are blanketed in the flags of competing countries -- but host and government ally Russia is taking centre stage. The flags of usual favourites Argentina, Germany, and Brazil are still displayed prominently, but years of steadfast Russian support to Syria's war-weary government has earned it newfound football fandom. Its tri-colour hangs from ropes strung across the packed streets of the Al-Qaymariyah market in Damascus's Old City, and pokes out of a bouquet of flags planted outside one shopfront. "Before the troubles in Syria, no one would support the Russian team. It was a regular team, not a particularly strong one," says Ahmad al-Mudramani, an avid football fan who runs an electronics store in Al-Qaymariyah. "But after they intervened in Syria, they found supporters here," he says. Mudramani manages a Facebook forum on football, where 70,000 users discuss sports news ahead of the 2018 FIFA World Cup, which opens Thursday. Bent over his laptop, he scrolls through streams of commentary and even surveys. Most, says Mudramani, lean towards "supporting strong teams like Brazil and Argentina. But Russia keeps coming up in the comments and polls." Syria's conflict erupted in 2011, a year after the 2010 World Cup. By the next tournament, in 2014, Syria was torn apart by war, government forces had lost swathes of territory and the Islamic State group was touting its cross-border "caliphate". Football was not on Damascenes' minds. "In 2014, the war was at its peak in Damascus and people were busy trying to keep themselves safe," recalls Mudramani. But that changed when Moscow intervened the following year, dispatching warplanes and military advisers to bolster President Bashar al-Assad's struggling soldiers. Since then, Syrian troops have recaptured more than half the country, and Russia appears to have cashed in wins on the battlefield for fans on the football field. "People are at ease today -- they can watch the World Cup with passion instead of fear," says Mudramani. Football is massively popular in Syria, but the country has never qualified for the World Cup. It came the closest this year but lost in a heated match against Australia. Still, Hamoud Khamees displays Syria's two-star flag among dozens of others outside his modest storefront. Perched on a wooden chair, a wide grin across his face, he fields questions from passersby on the prices: medium-sized flags go for 500 Syrian pounds (about $1), while larger streamers cost 2,000 pounds, or $4. Bandanas are just 200 pounds, making them popular among younger children, says Khamees. "We used to sell Russian flags the night before United Nations Security Council meetings, or during major political developments," recalls Khamees. Russia has vetoed Security Council resolutions more than a dozen times to protect its Syrian ally. With the first match inching closer, flag sales are up. 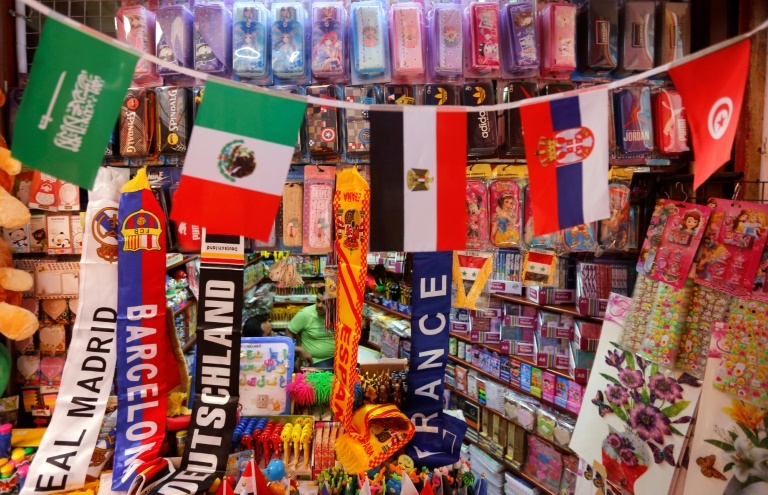 "I bought lots of Brazilian, German, and Argentinian flags, and I put Russian flags in the store window," says Khamees. "Some people buy the Russian flag to make a political statement through sports," he says. Nearby, loud music is blaring from storefronts in the Suwayqa market, known for its electronic products. Mahmud Abu Malek, 50, is stacking boxes of what he calls "decryption" machines -- used by Syrians to intercept satellite TV channels airing the World Cup without paying the exorbitant subscription packages. He just received a fresh delivery, but is already on the phone to his supplier telling him to prepare more. "There's a huge demand this year to follow the World Cup," he tells AFP, but legal access to satellite channels is unaffordable for most Syrians. Instead, they pay Abu Malek the equivalent of $12 for the machine and a week of access, or about $1,150 to tap into the channels for a year. Even that is expensive for most fans in Syria, so anyone backing Russia is unlikely to shell out as the team is not projected to make it past the first round. "There are the strong teams, Arab teams, and allied teams," lists Abu Malek, in reference to Russia and other countries which stood by Assad's government. "No one wants to buy an expensive machine to watch Russia play," he says. A few stores down, Bassem al-Rez is offering special discounts at his shoe store for any Argentina fans who walk in. But he still has a soft spot for Russia, he says. "Argentina first, but Russia's a friendly country. We're allies in war and in peace, so we'll be allies in sports too," says Rez, 33. "The Russian team is our ally, and a huge part of the Syrian population supports it. Their victory is our victory." 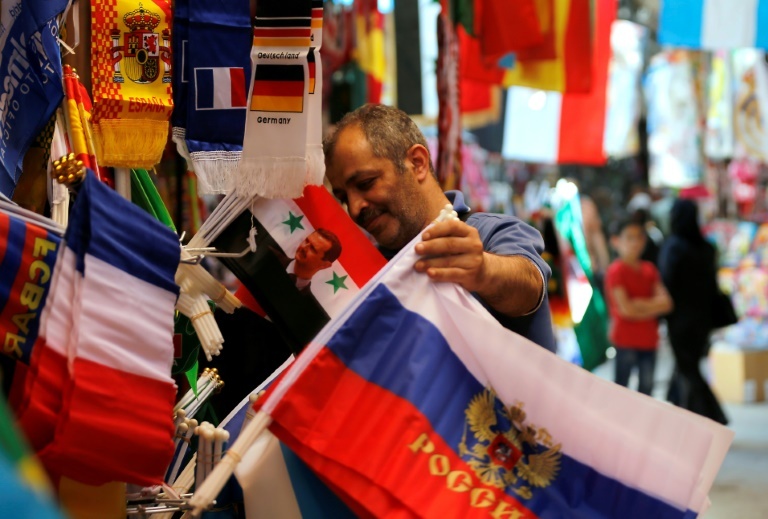 A Syrian vendor holds a Russian flag at a stall at a Damascus street market selling paraphernalia to football fans ahead of the World Cup picture taken on June 7, 2018 shows flags of countries participating in the upcoming 2018 FIFA World Cup on display among other flags outside a vendor's stall to be sold for football supporters and viewers, at a market street in the old city of the Syrian capital Damascus.